Yesterday I made pizzas for a party of 25 in Beverly Hills. The client’s(Amy) one specific request was for pizza with zucchini flowers and burratta cheese like they make at Mozza. She said her husband was a big fan. The burratta cheese was no problem I get it from the same place everyone in LA gets it from Gioia Cheese Company in El Monte. The zucchini flowers are a different story. I have only seen them in two farmer’s market in LA, the Culver City farmer’s market and the Hollywood farmer’s market. Zucchini flowers are definitely seasonal and usually are not available until late spring, but I saw them in Culver City in December which amazed me. When I asked the vendor about zucchini flowers in December he said they’re grown year round in San Diego. With this being said I thought that I would have no problem zipping over to the Hollywood farmer’s market on the way to the event to pick up some. My brain must have been snoozing when I told Amy that it would be no problem getting the zucchini flowers. I had forgotten that yesterday was the LA marathon and the Hollywood Farmer’s market is in the middle of the marathon. What was I thinking???? At 11:00am yesterday I found myself with my son Patrick on Cahuenga Blvd walking about 8 blocks, zigzagging through traffic and cutting in front of marathoners to get to the farmer’s market. Only to find after walking up and down the rows of stalls that the vendor, the one and only vendor who sells zucchini flowers, was not there. He probably stayed home because there was too much traffic. I asked other vendors and their reply was “It’s too early- zucchini flowers are available in May.” They gave me a look like I was stupid to think I could find Zucchini flowers this soon. Amy understood completely and I think her husband was more than satisfied with the mixed medley of mushrooms with thyme and mozzarella cheese. The hands in the photo are of my friend Anna from La Vecchia Quercia ristorante in Italy. 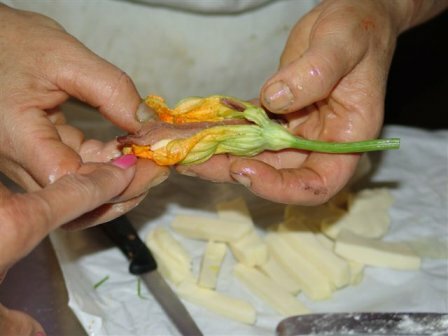 She is preparing the zucchini flowers to be stuffed with anchovies and mozzarella cheese which she will then lightly batter and deep fry.